In previous blogs, I introduced the Ellen MacArthur Foundation and it’s report “A New Textiles Economy: Redesigning Fashion’s Future”. 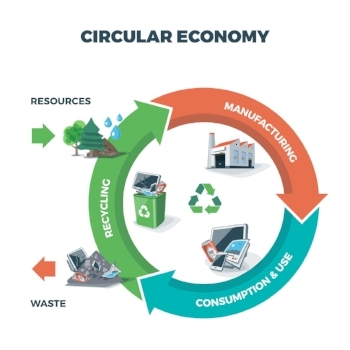 The report introduces four ambitions which would greatly reduce waste and environmental impact and help move the textile and apparel industries to a true circular economic model. 2) Drastically reduce plastic microfiber release. In my last blog, I addressed area #1. I discuss area #2 below. The second action item refers to the large amounts of microfibers, primarily polyester, that are being found in waterways, oceans and sea life around the world. Before addressing this issue, let me point out that in this context, the term “microfibers” can be a little misleading, at least to those of us familiar with textile and apparel industry vernacular. In our industry, microfiber typically describes a fiber or yarn which is extremely fine, equal to or less than 1 denier per filament. In this case, much of the fibers found in waterways are of larger denier, though still very small, hence the microfiber label. The hypothesis is that the main cause of this problem is fibers being released during laundering, which are then not filtered out in municipal water treatment or where grey water is not further treated at all. Much has been written on this and several well-conceived and executed studies have been performed to confirm this is the case. One such study, “Shedding of synthetic microfibers from textiles” (January 2016, University of Gothenburg, Sweden), I found especially well done and informative. The study focused on home laundering of synthetic fabrics and looked at the differences between continuous filament and spun staple yarns, as well as smooth fabrics and fleece. In general, the study team found that smooth fabrics shed relatively small amounts of fibers, roughly 35-40 fibers from 1 square meter of continuous filament fabric per liter of water leaving the washing machine, and 80-90 fibers per liter for fabrics made with spun polyester yarns. Fleece constructions were another matter, shedding an average of about 7500 fibers per liter, or about 100 times more than the flat fabrics. Clearly, fleece, suede, and other napped or brushed fabrics are more of a concern than flat and smooth constructions. This intuitively makes sense. There are several ways napped fabrics are made, including chemical treatment, sanding, brushing, and fiber shearing, which leaves both loose and weakened fibers exposed on the fabric surface. Several other studies have been performed, on both synthetic and natural fiber fabrics, with similar results. One such study, “Emissions of microplastic fibers from microfiber fleece during domestic washing” (2016, U. Pirc et al) found that fleece fabrics shed fibers in washing throughout their useful life, but interestingly, after the initial 2 or 3 washings, the amount of fiber shed is reduced by nearly a factor of 10 and remains consistent at the lower level in subsequent washings. · Favoring continuous filament polyester over spun yarns, whether 100% polyester or cotton-poly blends would help, to some extent, reduce the fibers entering waterways. There is empirical data which shows filament yarns shed less that spun yarns, and I believe spun cotton-poly blend yarns shed more polyester with time as the cotton degrades and loosens the fiber to fiber adhesion in the yarn structure. Simply put, continuous filament yarns, by their very nature, are much less likely to shed fibers than yarns which are essentially loose fibers to start with, held together by fiber to fiber adhesion in a spun yarn. · Brands and retailers should require all garments, especially fleece, be aggressively washed at the clothing factory before sale and of course assure that these factories have sophisticated filtration to prevent the fibers from being released into the environment. Commercial filtration technology is available to capture most if not all of the fibers shed in the washing which, if it’s polyester, could then be recycled. This step alone could eliminate an appreciable percentage of the fibers being released into waterways, especially in fleece garments. · Consumers should be made aware of this issue and be given guidance on how to minimize its impact. Washing clothes, especially fleece jackets and pullovers only when needed could help reduce this problem. In-line filters for washing machine outflow are available, and should be required. In addition, several products have been developed, like the Cora Ball or the Angelduck floating lint filter bag, which claim to effectively capture microfibers in the wash and be easily cleanable. I have not been able to find empirical proof of their effectiveness, and I believe a rigorous evaluation of these products would be worthwhile and should be performed. More importantly, as consumer awareness of this issue increases, so will demand and even more effective and easy solutions will naturally follow. · From a governmental standpoint, I do believe a requirement for easily cleaned filters on all washing machines sold is something that would be both economically and physically feasible. I’d like to know what you think. This is an important issue and all creative solutions should be heard and evaluated. I’d love to hear about and consider any you may have so please let me know. I will communicate any additive solutions in future blogs. You can respond to me via billjasperblog@gmail.com.